A pulmonologist’s dream: Tai Lam Country Park. Goliath-size buildings compete with actual mountains for skyscraping supremacy in this teeming metropolis, but those firefly-flecked hills can offer a surprising respite. Make the year-old Hotel Icon in Kowloon (from $284; 17 Science Museum Rd. ; hotel-icon.com) your home base: The ultramodern suites are walled with glass, and the lobby boasts a 2,475-square-foot vertical garden designed by French botanist Patrick Blanc. 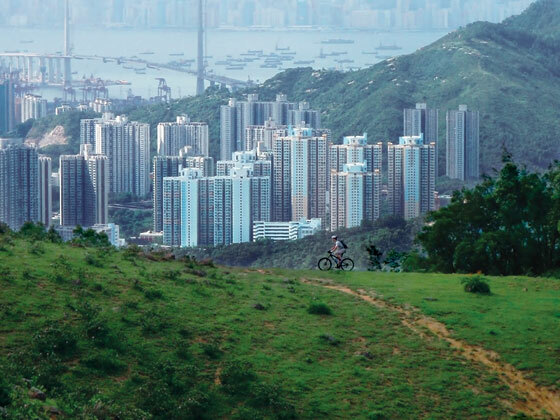 Sign up for a 3 1/2-hour mountain-bike tour with Steve Coward’s Crosscountry HK (from $121; 852-6300-1980; crosscountryhk.com) to tackle under-the-­radar trails like the recently redesigned Tin Fu Tsai North in Tai Lam Country Park. Hop a ferry to Hong Kong’s outlying islands, where you can spot free-roaming water buffalo near ­Launtau’s Pui O Beach or have lunch at one of ­Lamma’s harborfront mom-and-pop eateries. Back in town, order pitchers of Pimm’s Cups ($36) at the ­Upper House ­Hotel’s grassy outdoor cocktail lounge (Pacific Palace, 88 Queens­way; 852-2918-1838) or zip up to the world’s highest bar, Ozone in the Ritz-Carlton, Hong Kong (1 Austin Rd. W.; 852-2263-2263), 118 vertigo-inducing floors above the city din. Table of Contents: Apr 23, 2012 issue of New York | Subscribe!